Russia has extended its list of countries subject to a food import ban in retaliation for Western sanctions over the Ukraine crisis. Prime Minister Dmitry Medvedev said the ban would now apply to Iceland, Liechtenstein, Albania and Montenegro. He said Ukraine would be added in 2016 if an economic agreement between Kiev and the European Union came into force. The bulldozing of tonnes of Western-produced cheese and other foodstuffs has angered anti-poverty campaigners. The country began destroying banned produce earlier this month, steamrollering fruit and burning boxes of bacon. Critics say it should be used to feed the poor and hungry. The move comes after the EU and US introduced sanctions over Russia's annexation of Crimea and actions in eastern Ukraine. Certain products from EU countries as well as Australia, Canada, Norway and the US were banned in August last year. Speaking at a cabinet of ministers on Thursday, the PM said Iceland, Liechtenstein, Albania and Montenegro would also now be affected because they had joined EU sanctions against Russia. "Joining the sanctions is a conscious choice which means readiness for retaliatory measures from our part, which have been adopted," Mr Medvedev said in comments broadcast on state-owned channel Rossiya 24. The ban includes meat, fish, dairy products, fruit and vegetables. 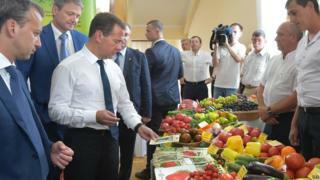 Mr Medvedev said on Wednesday that the counter-sanctions had given domestic agriculture a significant boost and had not caused shortages, according to Rossiya 24. Russian authorities have also started burning Dutch flowers, saying they pose a safety risk because they may be infected with pests. But critics say Russia wants to take revenge on the Netherlands over its handling of the investigation into the downing of Malaysia Airlines flight MH17 over rebel-held eastern Ukraine last year. In a rare move against President Vladimir Putin, Russia's Communist Party announced on Thursday it had submitted a bill to parliament calling for smuggled Western food to be given to the needy instead of being destroyed. The Kremlin says food cannot be given away because it could be unsafe. Heard the Russian jokes about Parmesan and condoms?